Within the primate visual system, areas at lower levels of the cortical hierarchy process basic visual features, whereas those at higher levels, such as the frontal eye fields (FEF), are thought to modulate sensory processes via feedback connections. Despite these functional exchanges during perception, there is little shared activity between early and late visual regions at rest. How interactions emerge between regions encompassing distinct levels of the visual hierarchy remains unknown. Here we combined neuroimaging, non-invasive cortical stimulation and computational modelling to characterize changes in functional interactions across widespread neural networks before and after local inhibition of primary visual cortex or FEF. We found that stimulation of early visual cortex selectively increased feedforward interactions with FEF and extrastriate visual areas, whereas identical stimulation of the FEF decreased feedback interactions with early visual areas. Computational modelling suggests that these opposing effects reflect a fast-slow timescale hierarchy from sensory to association areas. In humans, the parts of the brain involved in vision are organized into distinct regions that are arranged into a hierarchy. Each of these regions contains neurons that are specialized for a particular role, such as responding to shape, color or motion. To actually ‘see’ an object, these different regions must communicate with each other and exchange information via connections between lower and higher levels of the hierarchy. However, it remains unclear how these connections work. A brain region called the primary visual cortex is the lowest level of the visual cortical hierarchy as it is the first area to receive information from the eye. This region then passes information to higher regions in the hierarchy including the frontal eye fields (FEF), which help to control visual attention and eye movements. In turn, the FEF is thought to provide ‘feedback’ to the primary visual cortex. Cocchi et al. examined how the FEF and primary visual cortex communicate with the rest of the brain by temporarily inhibiting the activity of these regions in human volunteers. The experiments show that inhibiting the primary visual cortex increased communication between this region and higher level visual areas. On the other hand, inhibiting the FEF reduced communication between this region and lower visual areas. Computer simulations revealed that inhibiting particular brain regions alters communication between visual regions by changing the timing of local neural activity. In the simulations, inhibiting the primary visual cortex slows down neural activity in that region, leading to better communication with higher regions, which already operate on slower timescales. By contrast, inhibition of the FEF reduces its influence on lower visual regions by increasing the difference in timescales of neural activity between these regions. The next step is to determine whether similar mechanisms regulate changes in the activity of neural networks outside of the visual system. The primate visual system is a hierarchical network of feedforward and feedback connections that supports visual perception, object recognition and selective attention (Gilbert, 2013). At the earliest level of the visual hierarchy, the primary visual cortex receives input from the lateral geniculate nucleus and propagates this information to higher association areas including the posterior parietal cortex, ventral temporal cortex and frontal eye fields (FEF) (Hubel and Wiesel, 1962; Felleman and Van Essen, 1991; Van Essen and Maunsell, 1983; Maunsell and van Essen, 1983). During active perception, neural signals originating in these later cortical areas provide top-down modulation of activity in early visual areas, depending on factors such as expectation and context (Gilbert, 2013; Felleman and Van Essen, 1991; Moore and Armstrong, 2003; Bastos et al., 2015). Functional interactions between early sensory regions and later association areas have been investigated in humans using task-based functional magnetic resonance imaging (fMRI) (Bressler et al., 2008; Vossel et al., 2012). This work has demonstrated that task demands play an important role in determining the nature of the interactions between early and late visual cortex (Gilbert, 2013). For example, studies combining fMRI with transcranial magnetic stimulation (TMS) during performance of visual tasks have shown that stimulation of the FEF can modulate neural activity in several visual areas, including the primary visual cortex (area V1) (Bressler et al., 2008; Ruff et al., 2006, 2008). Increments in the strength of excitatory TMS over the right FEF have been shown to increase neural activity in early retinotopic cortex representing the peripheral visual field, and to reduce activity in central visual-field representations (Ruff et al., 2006). This neurophysiological effect confers a perceptual advantage for detection of stimuli in the visual periphery relative to the fovea (Ruff et al., 2006). Despite evidence for dynamic bidirectional interactions between FEF and early visual cortex during task-related visual processing, numerous findings from resting-state fMRI (rsfMRI) studies, in both human and non-human primates, suggest there is little or no functional coupling between these regions in the absence of active task demands (i.e., in the resting-state) (Vincent et al., 2007; Belcher et al., 2013; Damoiseaux et al., 2006; Yeo et al., 2011; Power et al., 2011; Mantini et al., 2013; Gordon et al., 2016). At rest, FEF belongs to extensive networks of fronto-parietal regions (Yeo et al., 2011; Power et al., 2011), whereas the early visual cortex, including area V1, belongs to a primary visual network encompassing occipital and inferior parietal regions (Yeo et al., 2011; Power et al., 2011; Gordon et al., 2016). Despite this apparent functional segregation between visual networks encompassing early visual cortex and FEF at rest, the nature of any latent interactions between them remains unknown. Likewise, the neural principles facilitating the emergence of integration between segregated regions at opposing ends of the visual cortical hierarchy remain unclear. Here we combined rsfMRI and non-invasive brain stimulation to examine the causal influence of perturbations of local neural activity within early and late visual areas – specifically areas V1/V2 and FEF – in the absence of visual task demands. Across two separate imaging sessions, we employed continuous theta-burst TMS (Huang et al., 2005) to inhibit intrinsic neural activity either within the right occipital pole or within the right FEF. We recorded resting-state brain activity immediately before and after TMS, and examined the influence of this perturbation on functional and effective connectivity between the targeted regions and the rest of the brain. We also employed computational modelling to provide candidate mechanisms for expected changes in interactions between cortical regions following local stimulation. Based on recent empirical (Hasson et al., 2008; Murray et al., 2014; Bassett et al., 2013; Lerner et al., 2011; Honey et al., 2012; Gauthier et al., 2012) and computational (Gollo et al., 2015; Chaudhuri et al., 2015) work we tested the hypothesis that a temporal hierarchy of timescales, recapitulating the hierarchical organization of neuronal receptive fields, can explain the effects of local stimulation on inter-regional connectivity. According to the model, activity in higher regions such as FEF fluctuates at a slower temporal scale than activity in early sensory regions such as V1/V2 (Murray et al., 2014; Honey et al., 2012; Chaudhuri et al., 2015). We simulated the effects of local inhibition of early and late visual areas to test whether the proposed temporal gradient from sensory areas (fast) to association areas (slow) matched the observed changes in connectivity following local cortical perturbations in human participants. Our experimental and modelling results suggest that local inhibition of early visual cortex reduces the discrepancy in endogenous synchronization between lower and higher levels of the visual cortical hierarchy, whereas inhibition of FEF increases the discrepancy. Our work provides novel insights into the neural mechanisms that underlie the effects of local inhibition on large-scale brain dynamics. Twenty-three healthy adult volunteers participated in two combined TMS-rsfMRI experiments, conducted on separate days. The number of participants was decided based on previous work adopting a similar experimental design (Cocchi et al., 2015; Eldaief et al., 2011). A schematic representation of the complete experimental protocol is presented in Figure 1 (details in the Materials and methods). After exclusion of data from two participants due to excessive head motion or medication, we analyzed resting-state data from 21 of the participants (11 female mean age 27.7, S.D. ± 5.2 years) acquired on a 3T Siemens Trio scanner. Immediately following an initial rsfMRI session, continuous (inhibitory) theta-burst TMS (Huang et al., 2005) was applied over one of two different cortical regions of interest (ROIs). A repeat rsfMRI scan was acquired from each participant immediately following TMS stimulation. The anatomical locations of the two TMS targets were: (1) Right early visual cortex – the posterior aspect of the medial occipital lobe (MNI centroid x = 25, y = −92, z = −9), corresponding with areas V1/V2; and (2) Right FEF (MNI centroid x = 31 y = −2, z = 47) – a brain hub within the frontal cortex (see Materials and methods for target region identification). The exact locations of the stimulation sites for each participant are shown in Figure 1—figure supplement 1. During TMS, participants closed their eyes and were seated to ensure a relaxed muscle state. This procedure ensured that local stimulation was delivered with participants in a state of rest and in the absence of structured visual input. The order of stimulation of the two cortical sites was counterbalanced across participants. Participants initially underwent a high-resolution structural MR scan, which was used to define subject-specific coordinates for subsequent sites of TMS (see Materials and methods for further detail). In Experimental Session 1 and Experimental Session 2, participants undertook 12 min of resting-state functional magnetic resonance imaging (rsfMRI) immediately before and after inhibitory theta-burst stimulation (Huang et al., 2005) was applied to one of the two right hemisphere sites (occipital pole or frontal eye fields). All participants underwent stimulation of each of the two target sites across separate sessions. For safety reasons and to avoid carry-over effects of TMS across sessions, Experimental Sessions 1 and 2 were conducted on different days, separated by at least one week, but no more than three weeks (Huang et al., 2005). The order of stimulation of the two cortical sites was counterbalanced across participants. Abbreviations: T1= structural scan; TMS = transcranial magnetic stimulation. To characterize the intrinsic connectivity profiles of the two seed regions-of-interest (ROIs; 7.5 mm radius) at baseline, we conducted seed-to-whole brain functional connectivity analyses of the resting-state data acquired prior to focal stimulation. These analyses quantified the correlation between the blood-oxygen-level dependent (BOLD) signal timecourse extracted from the seed ROIs and the timecourses extracted from all other brain voxels (see Materials and methods). The ROIs were centered on coordinates within the right occipital pole and the right FEF, as specified above. As shown in Figure 2, activity within the right occipital seed (V1/V2) was positively correlated with activity in other nodes of the visual network, including the lingual gyri, fusiform gyri, the lateral occipital cortex, and the cuneus bilaterally (Yeo et al., 2011; Power et al., 2011; Gordon et al., 2016) (p<0.05 familywise error corrected at cluster level (FWE), Figure 2a – red). By contrast, activity in the same occipital seed was negatively correlated (i.e., anticorrelated) with activity in bilateral FEF, the left supramarginal gyrus, the left inferior post-central gyrus, and the left posterior insula (Figure 2a – blue, p<0.05 FWE). These results confirm and extend previous findings by showing that in the absence of active visual task demands, interactions between early visual cortex and the right FEF can be anticorrelated (Yeo et al., 2011; Power et al., 2011; Gordon et al., 2016; Ekstrom et al., 2008). Baseline connectivity between TMS-targeted regions and the rest of the brain before stimulation. (a) Regions with higher functional connectivity with early visual cortex at the right occipital pole (site of subsequent inhibitory TMS) in the baseline resting-state (i.e., before TMS). At baseline, activity in the frontal eye fields (FEF), left supramarginal gyrus, left inferior postcentral gyrus, and left insula was anticorrelated with activity in right early visual cortex (corresponding to the to-be-targeted region of the occipital pole; pink circle). 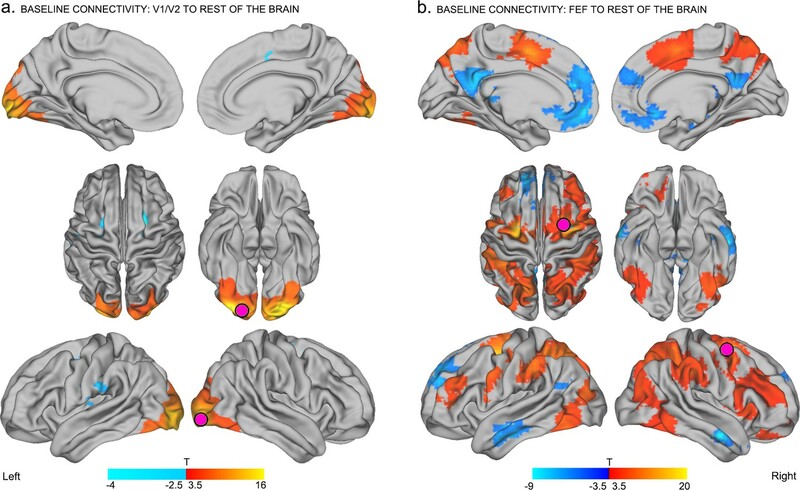 (b) Regions with positive (red – yellow) and negative (blue – light blue) functional connectivity with the right FEF at baseline. The right FEF showed a diffuse pattern of connectivity encompassing frontal, parietal, and temporal cortical areas. Regions known to be part of the default-mode network (medial prefrontal cortex, posterior cingulate, angular gyrus, and medial temporal gyrus) were significantly anticorrelated with the right FEF at baseline. All results are p<0.05 FWE corrected at cluster level. Neural activity in the right FEF seed was positively correlated with activity in bilateral supplementary motor areas, medial dorsal cingulate, bilateral dorsolateral prefrontal cortex, bilateral superior parietal cortex, and extrastriate visual areas including bilateral precuneus, middle occipital gyri, and inferior temporal gyri (Figure 2b – red, p<0.05 FWE). Activity within the right FEF seed was also negatively correlated with activity in default mode regions encompassing the medial prefrontal cortex, posterior cingulate cortex, angular gyrus and bilateral medial temporal gyri (Power et al., 2011) (Figure 2b – blue, p<0.05 FWE). These findings are consistent with those of previous neuroimaging studies of intrinsic functional connectivity profiles of human FEF (Yeo et al., 2011; Hutchison et al., 2012), and related findings in macaque (Vincent et al., 2007; Hutchison et al., 2012). Specifically, our results support the idea that the FEF is a functional brain hub, with widespread connections to a variety of resting-state networks including the fronto-parietal and default-mode systems (Power et al., 2013; Fornito et al., 2016; van den Heuvel, 2013a, 2013b). Note that the aforementioned baseline effects were replicated using different sized TMS-seed regions (see Figure 2—figure supplement 1), baseline data (Figure 2—figure supplement 2) and preprocessing procedures (including global signal regression; see Materials and methods). Having established baseline patterns of whole-brain connectivity for the two seed regions at rest, we next examined the influence of local inhibitory TMS on this network activity. To this end, we compared patterns of functional connectivity before and immediately after application of TMS over the right occipital pole and FEF target sites (see Materials and methods). Inhibitory TMS of right visual cortex (V1/V2) resulted in the emergence of positive correlations between this region and bilateral FEF (Figure 3—figure supplement 1 and Supplementary file 2). TMS of the visual cortex also resulted in the emergence/increase of positive correlations between V1/V2 and extrastriate visual regions including the lingual gyri, the lateral occipital cortex and the parietal cortex (p<0.05 FWE; Figure 3a – red, details in Supplementary files 1 and 2). These results were replicated when we adjusted the radius of the seed regions to 10 mm and 15 mm, and across different data preprocessing pipelines (Figure 3—figure supplement 2 and Materials and methods). On the other hand, inhibitory TMS of right FEF resulted in a reduction in positive correlations between the targeted FEF region and visual areas encompassing the bilateral fusiform and occipital gyri (Figure 3b – blue, details in Supplementary files 1 and 2). Overall, these effects were replicated using TMS-seed regions of 10 mm and 15 mm radius (see Figure 3—figure supplement 2) and using different preprocessing procedures (including global signal regression; see Materials and methods). Note that the individual sites of stimulation could not be unequivocally linked with specific effects on functional connectivity (Figure 3—figure supplement 3). Distinct effects of local inhibitory TMS over early visual cortex and FEF. (a) Inhibitory TMS of early visual cortex (right occipital pole; encircled lightning symbol) was associated with the emergence of positive correlations between BOLD signals in V1/V2 and bilateral FEF, and the emergence/increase of positive correlations between the V1/V2 seed region and bilateral occipital and parietal cortices (see Supplementary file 1 and 2 for details, p<0.05 FWE corrected at cluster level). (b) Inhibitory TMS of the right FEF (encircled lightning symbol) resulted in the reduction of positive correlations between this target region and bilateral occipital visual areas (p<0.05 FWE corrected at cluster level). We also assessed changes in functional connectivity pre- and post-TMS (for both V1/V2 and FEF sessions) using a control region ipsilateral to the TMS stimulation site but outside the networks of interest (i.e., the inferior portion of the right motor cortex, x = 51, y = −10, z = 18). These analyses revealed no significant changes in functional connectivity between the pre- and post-TMS scans, for both V1/V2 and FEF sessions. It is well known that the local effects of TMS can vary considerably across participants (Hamada et al., 2013). To investigate this issue, we examined whether TMS-induced changes in intrinsic connectivity were related to individual differences in local changes in BOLD signal fluctuations at the site of stimulation. We first extracted the mean amplitude of low-frequency fluctuations in BOLD (ALFF [Yang et al., 2007]) from the TMS-target site for each individual participant (see Materials and methods; details in Supplementary file 3). We then determined the correlation between TMS-induced changes in local ALFF and the change in functional connectivity between the targeted ROIs for each participant, with the significant clusters identified at the group level (Figure 3). There was a significant correlation between TMS-induced modulation of the amplitude of slow signal fluctuations (ALFF) and TMS-induced changes in functional connectivity for the right FEF (right FEF ROI to left visual cluster r = 0.6, p<0.01; right FEF ROI to right visual cluster r = 0.6, p<0.01) and for the right occipital pole (right occipital ROI to left visual cluster r = 0.4, trend-level p=0.05) (Figure 3—figure supplement 4). This analysis suggests that local TMS-induced reductions in neural activity, as indexed by the amplitude of slow fluctuations in the local BOLD signal, were associated with changes in functional connectivity across visual areas. Once again, these significant correlations were robust across different preprocessing procedures, including deletion (scrubbing) of motion-contaminated volumes (Power et al., 2012). Moreover, the effects remained after controlling for changes in mean BOLD signal between baseline and post-TMS sessions (FEF target seed to left visual cluster r = 0.5, p=0.01; FEF target seed to right visual cluster r = 0.5, p=0.01; occipital target seed to left visual cluster r = 0.4, p=0.05). Importantly, there was no significant relationship between TMS-induced changes in functional connectivity and ALFF values in the baseline and post-TMS sessions. As a further control, we also examined activity within homologous visual areas in the opposite (non-stimulated) hemisphere. There were no significant correlations between changes in the amplitudes of slow signal fluctuations (ALFF values) extracted from homologous visual areas in the left hemisphere (i.e., contralateral to the TMS-target sites in the right hemisphere) and changes in connectivity (left FEF seed to left visual cluster r = 0.2, p=0.42; left FEF seed to right visual cluster r = 0.1, p=0.71; left occipital seed to left visual cluster r = 0.2, p=0.12; left occipital seed to right visual cluster r = 0.2, p=0.51). Finally, there were no clear associations between changes in ALFF and individual TMS target sites (Figure 3—figure supplement 3). To further explore the nature and directionality of TMS-induced perturbations in functional connectivity, we employed stochastic dynamic causal modelling (DCM) (Daunizeau et al., 2012). DCM contributes to the analysis by modelling how one region exerts influence over another (i.e., effective connectivity, [Friston and Harrison, 2003]), which is not possible using traditional functional connectivity analysis. To this end, we generated two models comprising bidirectional links between the V1/V2 or FEF seed regions and the clusters showing significant changes in connectivity following TMS (Figure 3, details in the Materials and methods). DCM analyses of model parameters (pre- versus post-TMS) suggested that stimulation of V1/V2 altered the feedforward influence of V1/V2 on the right occipito-parietal cortex (details in Figure 3—figure supplement 5 and Supplementary file 1, paired t-test p=0.04). Conversely, stimulation of FEF significantly decreased the feedback influence of this region upon V1/V2 (Figure 3—figure supplement 5, p=0.0026 for the right cluster and p=0.0012 for the left cluster). Thus, for both V1/V2 and FEF, modulation of effective connectivity induced by focal TMS spread from the stimulation site to distant cortical regions. Results from functional and effective connectivity analyses suggest that V1/V2 stimulation (Figure 3, Figure 3—figure supplement 5) increased feedforward interactions between this cortical area and higher visual cortical areas. Conversely, reduced positive correlations following FEF stimulation were driven by a reduction in feedback connectivity (i.e., a reduced influence of FEF on V1/V2). Based on evidence from empirical and computational work (Hasson et al., 2008; Murray et al., 2014; Lerner et al., 2011; Honey et al., 2012; Gauthier et al., 2012; Gollo et al., 2015), we hypothesized that these opposing effects of inhibitory TMS on widespread connectivity might be accounted for by the different timescales at which sensory brain regions and network hubs fluctuate in their levels of activity. To test this hypothesis, we used the Kuramoto model of coupled heterogeneous oscillators, constrained by knowledge of whole brain anatomical connectivity and then adjusted to maximally match the acquired resting-state data at baseline (see Materials and methods for details). The effect of inhibitory TMS was simulated by slowing down (by a variable amount) the intrinsic frequency of the target region. This decision was motivated by the observation that changes in connectivity induced by inhibitory TMS were related to a reduction in the power of the local BOLD signal. Such an energy decrease is embodied in our oscillatory model by a slowdown in the intrinsic oscillatory frequency. The model simulates the dynamics of the whole brain at a relatively high resolution (513 uniformly sized cortical and sub-cortical regions). We focused on the differences in functional connectivity between the two regions targeted by TMS (V1/V2 and FEF) and the rest of the brain. Simulation results showed that virtual inhibition of right V1/V2 within the model increased the positive correlations between this region and the rest of the brain (red in Figure 4a), consistent with the group effects we observed following actual TMS over this region in our participant group. This increase in connectivity was robust across a broad range of parameters (i.e., slowing of intrinsic frequencies, omega, Figure 4a). 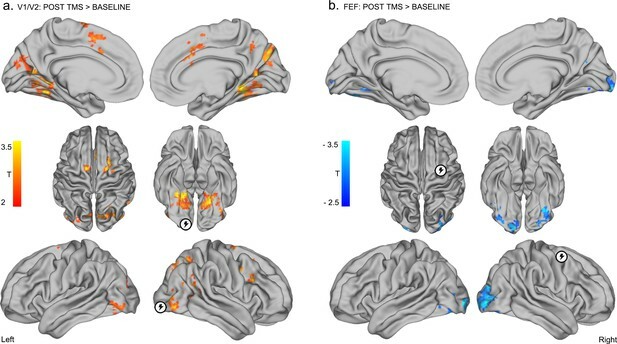 Importantly, we found that the simulated effect of local V1/V2 inhibition was due mainly to a significant increase in connectivity between this node and other nodes encompassing occipito-temporal and frontal areas of the right hemisphere (Figure 4b). Conversely, simulated inhibition of FEF, again by slowing its intrinsic frequency, was associated with the reduction of correlations in this region’s connectivity with the rest of the brain (blue in Figure 4a and Figure 4—figure supplement 1). This significant effect involved right frontal areas surrounding FEF, and occipito-temporal cortices (Figure 4c). Overall, the effects observed within the model were consistent with the effects observed following actual TMS of V1/V2 and FEF in the experimental participants. Modelling the effects of local inhibitory TMS on diffuse network connectivity. (a) In line with the experimental results, computational modelling showed that inhibition of the intrinsic frequencies of V1/V2 and FEF (see Materials and methods) had opposite effects on how these regions were connected with the rest of the brain. Specifically, increasing inhibition of V1/V2 enhanced functional connectivity (i.e., positive correlations) with the rest of the brain until the natural frequency of V1/V2 matched the mean frequency of the whole brain (gray dot). Conversely, inhibition of FEF reduced its positive correlations, or enhanced its anticorrelations, with other brain regions (see also Figure 4—figure supplement 1). s.e.m.= standard error of the mean. (b) Following a reduction in its natural frequency, V1/V2 significantly increased its connectivity with other cortical regions comprising occipito-temporal and frontal areas (including FEF; Wilcoxon signed-rank test Bonferroni corrected for multiple comparisons, p<2 x 10−6). (c) A significant reduction in correlations and increase in anticorrelations between FEF and surrounding frontal areas, as well as visual occipito-temporal areas, was observed after slowing of the natural frequency of FEF (Wilcoxon signed-rank test, p<2 x 10−6). The reduction in omega for panels (b) and (c) was 0.0008. To test whether the opposing changes in functional connectivity revealed by the simulations were driven by non-specific effects of local stimulation, we performed several additional simulations. First, we assessed whether inhibition (delta ω of 0.001) of cortical regions not relevant for our hypotheses – in this instance areas in the vicinity of the right postcentral gyrus and left superior temporal gyrus – could also produce effects on functional connectivity similar to those observed after simulated inhibition of V1/V2 or FEF. Second, we tested whether inhibition of these two control regions would cause specific changes in functional connectivity between early visual cortex and FEF. Simulated inhibition of either control region yielded a markedly different change in connectivity than that observed following simulated inhibition of V1/V2 or FEF (see Figure 4—figure supplement 2). Moreover, connectivity between V1/V2 and FEF was not affected by simulated inhibition of either of the two control regions. We examined dynamic reconfigurations of intrinsic interactions between cortical areas at lower and higher ends of the visual hierarchy in humans following local stimulation with TMS. We applied inhibitory theta-burst stimulation via TMS to one of two regions – early visual cortex and FEF – within the right hemisphere, and examined changes in functional and effective connectivity in the resting-state. Local inhibitory TMS of these regions generated opposing patterns of connectivity between early and late areas within the cortical hierarchy. These distinct effects are consistent with an intrinsic timescale-based cortical hierarchy (Murray et al., 2014; Bassett et al., 2013; Lerner et al., 2011; Honey et al., 2012; Gauthier et al., 2012; Gollo et al., 2015; Chaudhuri et al., 2015), with early visual areas (V1/V2) exhibiting shorter timescales than those of higher areas (such as FEF). By incorporating these timescale effects, the computational model provides supporting evidence for opposing changes in diffuse connectivity following focal inhibitory TMS in the human brain. This finding highlights that inter-regional effects of focal TMS can be predicted by the hierarchical organization of timescales across the cerebral cortex. At baseline, prior to inhibitory stimulation, neural activity in early visual cortex was anticorrelated with activity in the FEF bilaterally. Previous neuroimaging work in humans and monkey has suggested little or no functional coupling between FEF and V1/V2 in the resting state (Vincent et al., 2007; Belcher et al., 2013; Damoiseaux et al., 2006; Yeo et al., 2011; Power et al., 2011; Mantini et al., 2013; Gordon et al., 2016). For instance, areas V1 and V2 lie within a primary visual network that does not include FEF (Yeo et al., 2011). Our results support previous work by showing a functional segregation between early and late areas within the visual cortical hierarchy at rest. This finding is consistent with the notion that task-induced changes in sensory visual areas may drive the emergence of functional integration between levels of the visual cortical hierarchy (Ekstrom et al., 2008; Roelfsema, 2006). A novel finding of our study is that inhibition of early visual cortex resulted in the emergence of positive correlations between this region and FEF, along with other extrastriate and parietal visual areas. Previous studies have investigated intrinsic reconfigurations of large-scale neural systems following focal perturbations of peripheral sensorimotor regions (e.g., Cocchi et al., 2015; O'Shea et al., 2007; Grefkes and Fink, 2011). In line with our results, fMRI studies have shown that local perturbation of primary motor areas can lead to recruitment of related areas (O'Shea et al., 2007; Grefkes and Fink, 2011; Cocchi et al., 2015). For example, inhibitory TMS of the primary motor cortex in healthy adults has recently been shown to increase the strength of resting-state functional connectivity within the sensorimotor system (Cocchi et al., 2015). Our finding that unilateral inhibition of early visual cortex increases the positive coupling with FEF and other visual areas adds to a growing literature suggesting that local perturbations of neural activity in peripheral nodes recruit functionally related brain regions (Cocchi et al., 2015; O'Shea et al., 2007; Grefkes and Fink, 2011; Bestmann et al., 2010). Specifically, our computational modelling suggests that the effect of inhibitory TMS of early visual cortex might be due to slowing of intrinsic timescales within V1/V2, so that they become closer to the slow intrinsic fluctuations of higher cortical regions such as the parietal cortex and FEF (Murray et al., 2014; Honey et al., 2012; Gollo et al., 2015; Chaudhuri et al., 2015). In contrast to the increased positive coupling apparent after inhibition of early visual cortex, an identical inhibitory TMS protocol delivered over the right FEF led to decoupling between the target region and bilateral early visual cortex. Results from the DCM analysis suggest that such functional decoupling was related to a significant decrease in feedback signals from FEF to early visual cortex. In keeping with the neural mechanism proposed to explain increased connectivity following the inhibition of V1/V2, results from our computational model suggest that the observed reduction in feedback modulation from FEF to V1/V2 can be explained by a further slowing of local FEF dynamics by TMS. The observed changes in connectivity following inhibitory TMS may therefore be explained in terms of a reduction in synchronization discrepancy following local stimulation of V1/V2 and an increase in synchronization discrepancy following stimulation of FEF. Within this broad context, preliminary analyses suggest that there are a host of topographical specificities and nuances that accompany virtual simulations. Further work is needed to address the specificity of our model and the source of possible discrepancies between virtual and empirical findings. Our findings also reveal a relationship between the magnitude of local signal change and remote modulations in intrinsic functional connectivity. We found that TMS-induced changes in local BOLD signal amplitude at the stimulation site were related to remote modulations in functional connectivity. This suggests that variations in ongoing low-frequency (<0.1 Hz) fluctuations may be a marker of TMS-induced modulation of widespread cortical connectivity. The dynamic integration of information between sensory and association regions of the cortex is essential for normal brain function. Here we combined functional brain imaging, neural stimulation and computational modelling to elucidate the neural mechanisms that support the emergence and dissolution of interactions between cortical regions within the human visual system following local perturbations in neural activity. Our results suggest that the selective effect of local inhibitory TMS on diffuse patterns of connectivity can be accounted for by an intrinsic hierarchical ordering of cortical timescales (Murray et al., 2014; Honey et al., 2012; Gollo et al., 2015). The study was approved by The University of Queensland Human Research Ethics Committee. Written informed consent was obtained for all participants. Target regions for inhibitory theta-burst TMS were defined using high-resolution structural T1 3D images obtained for each participant and loaded into an ANT Visor Neuro-navigation system with NDI Polaris Spectra infrared camera. The two TMS target sites were identified prior to the first experimental session (Figure 1). The anatomical locations of the TMS target coordinates were manually refined according to each individual participant's anatomy. Specifically, if the target region was located in a sulcus, the location for TMS was moved to the gyrus closest to the centroid coordinate (V1/V2: MNI centroid x = 25, y = −92, z = −9; FEF: MNI centroid x = 31 y = −2, z = 47). The early visual cortex target was located anatomically within the occipital pole, posterior to the descending occipital gyrus laterally and the lingual gyrus medially (corresponding to areas V1/V2 [Thiebaut de Schotten et al., 2014]). In line with previous studies, the FEF target was located anatomically within the posterior middle frontal gyrus, immediately ventral to the junction of the superior frontal sulcus and ascending limb of the pre-central sulcus (Ruff et al., 2006; Heinen et al., 2014). A continuous theta-burst TMS protocol was utilized to induce local inhibition of cortical activity using a previously validated protocol (Huang et al., 2005). The inhibitory TMS protocol involved uninterrupted (40 seconds) bursts of 3 TMS pulses delivered at 50 Hz, repeated at 200 ms intervals. TMS was administered using a figure-of-eight coil (70 mm diameter). For FEF stimulation, the TMS coil handle was held at a 45-degree angle to the sagittal plane (Nyffeler et al., 2006). For stimulation of the right occipital pole, the coil was oriented with the handle pointing to the right (Kammer et al., 2001). The intensity of the inhibitory stimulation of the two cortical ROIs was set to 80% of the active motor threshold (Huang et al., 2005; Cocchi et al., 2015). The active motor threshold was defined as the minimum TMS intensity required to trigger a motor evoked potential (MEP) > 200 µV in at least three out of five consecutive trials while participants were actively contracting their hand muscle (using a pincer grip) at a level equivalent to ~20% of their maximum voluntary contraction (Huang et al., 2005). The location used to establish the active motor threshold was identified with single-pulses of TMS over the right hemisphere. The TMS coil was systematically moved until the optimal cortical site to induce the largest and most reliable motor response (motor evoked potential, MEP) in a muscle of the left hand (the abductor pollicis brevis (APB) muscle) was established. MEPs were recorded using surface electromyography (EMG) electrodes (Ag-AgCl) from the left APB. Electromyography signals were amplified (x1000) and filtered (5–500 Hz) using a Neurolog system (Digitimer, UK), and digitised (20 kHz) using a data acquisition interface (BNC-2110; National Instruments) and custom Matlab software (MathWorks [Natick, Massachusetts], see Source code 1). During resting state fMRI scans, participants were instructed to keep their eyes open and to fixate on a central white cross on a uniform black background. Participants were instructed to let their minds wander freely during the scan. Eye tracking video software was employed to ensure that participants kept their eyes open and looked straight ahead throughout the sessions of resting-state fMRI data acquisition. The eye-open resting-state protocol was preferred over the eye-closed protocol due to recent concerns about controlling wakefulness when participants have their eyes closed (Tagliazucchi and Laufs, 2014). Neuroimaging data were acquired using a 3T Siemens Trio scanner equipped with a 32-channel head coil at The University of Queensland’s Centre for Advanced Imaging (Australia). Whole brain T2* images were acquired using an echo-planar imaging sequence (38 axial slices, 320 volumes, gap = 10%, slice thickness = 3 mm, in-plane resolution = 64 × 64, time repetition = 2250 ms, time echo = 28 ms, flip angle = 90°, FOV= 210 × 210 mm, descending slice acquisition). T1 3D images were acquired using the following parameters: 192 axial slices, slice thickness = 0.9 mm; in-plane resolution = 64 × 64, time repetition = 1900 ms, flip angle= 9°, time echo = 2.32 ms, FOV = 230 × 230 mm. Preprocessing of the resting-state fMRI data was performed using the Data Processing Assistant for Resting-State fMRI 3 (Chao-Gan and Yu-Feng, 2010). The first 10 image volumes were discarded to allow tissue magnetization to reach a steady-state and to provide participants with an opportunity to adapt to the MR scanner environment. DICOM images were converted to Nifti format and underwent slice time correction. To improve normalization, individual participant structural images (T1) were coregistered to functional images using the DARTEL algorithm implemented within the Matlab toolbox SPM8. Tissue segmentation (gray matter, white matter and cerebrospinal fluid) was performed to improve the characterization of non-neural signals in subject space. The following nuisance covariates were regressed from each voxel’s time series: six head motion parameters, linear trends, volume-level mean of frame-to-frame displacements greater than 0.4 mm (including the preceding and two subsequent frames [Power et al., 2014]) and signals related to time-series unlikely to be modulated by neural activity (CompCor method [Behzadi et al., 2007]). After covariate regression, images were normalized to standard MNI space, smoothed using a Gaussian function with a 6 mm full width at half maximum kernel. Finally, a temporal bandpass filter was applied retaining frequencies between 0.01–0.1 Hz. Supplementary analyses demonstrated that both the mean frame-wise displacement (Power et al., 2014) and the number of scrubbed volumes were not significantly different for the pre- and post-TMS scans, in either experimental session. Note that after scrubbing motion-contaminated volumes (Power et al., 2014), the number of remaining volumes for each functional scanning session exceeded 8.8 min, which is sufficient time to capture stable correlation coefficients (Van Dijk et al., 2010). Thus, the results reported reflect the outcomes following motion correction (i.e., re-alignment, regression of the six head motion parameters and scrubbing). Given recent concerns in the literature regarding the use of global signal regression, we did not regress the mean global signal during pre-processing. The mean global signal was not significantly different across pre- and post-TMS sessions, for either stimulation site (occipital TMS session: t20 = 1.22, p=0.23, FEF TMS session: t20 = 0.941, p=0.35). Nevertheless, to ensure that this methodological decision did not alter the main results reported here, we re-ran the analysis incorporating regression of the mean BOLD signal, and obtained similar results. Seed-to-voxel correlation analyses were conducted to examine patterns of functional connectivity between seed ROIs (TMS target sites) with voxels in the rest of the brain. We first extracted the mean timeseries across grey matter voxels within a quasi-spherical grey matter seed (radius ~7.5 mm) centered on the group-level coordinates in the right occipital pole (MNI centroid x = 25, y = −92, z = −9) and right FEF (MNI centroid x = 31 y = −2, z = 47). Note that all of the results presented in the main text were obtained using the grey matter ROIs with a radius of 7.5 mm. While this ROI dimension was found to best encompass the participants’ targeted brain areas in standard MNI space, the main findings were also replicated using additional ROIs with radii of 10 mm and 15 mm; see Figure 2—figure supplement 1 and Figure 3—figure supplement 2. We then conducted a seed-to-voxel analysis, whereby the mean timeseries extracted within each seed ROI was correlated with the timeseries extracted from each voxel in the rest of the brain. This analysis enabled the generation of subject-level spatial maps representing correlation coefficients between the targeted seed with each individual brain voxel for both pre- and post-TMS sessions. The resulting correlation coefficients were Z-transformed to improve the application of univariate second-level statistics. Seed-to-voxel functional connectivity was calculated at baseline (session specific) using one-sample t-tests, for both experimental sessions (V1/V2 and FEF, FWE corrected threshold of p<0.05 at the cluster level, Figure 2). Seed-to-voxel functional connectivity was compared across the pre (session specific)- and post-TMS scans using paired-sample t-tests, for both resting-state fMRI sessions (V1/V2 and FEF, FWE corrected threshold of p<0.05 at the cluster level, Figure 3). The amplitude of low frequency fluctuations (Yang et al., 2007) (ALFF, 0.01–0.1 Hz) was extracted from each ROI for each individual participant, for both the pre- and post-TMS scanning sessions. We then correlated the TMS-induced change in ALFF with the TMS-induced changes in functional connectivity between the target seed and the significant group level clusters identified in the previous analysis (see Neuroimaging analysis: Seed-to-voxel analysis) using bivariate Pearson’s correlations. Effects of TMS stimulation on effective connectivity were analyzed using stochastic DCM implemented in DCM12 (Daunizeau et al., 2012). DCM is a computational framework for inferring effective connectivity between cortical regions. Model estimation rests on the Bayesian inversion of state space models by combining dynamic models of neural states with biophysical models of hemodynamics (Friston et al., 2014). Importantly, stochastic DCM allows inverting models with uncertainty about the temporal specification of inputs. Because these inputs can represent intrinsic fluctuations, stochastic DCM is particularly useful for model inversion of resting-state data (Stephan et al., 2010). For each participant, timeseries were extracted from regions of interest defined by the seed-to-voxel analysis of functional connectivity (Figure 3). For both stimulation sessions (Figure 1) we used a 7.5 mm spherical seed on targeted regions and main clusters showing a significant TMS effect (Figure 3, Figure 3—figure supplement 5). This resulted in two distinct models (one for each session) with bidirectional connections between the respective TMS target region (V1/V2 or FEF) and the selected clusters. The models were subsequently inverted to estimate subject-specific parameters. At the group level, the model parameters between the pre- and post-TMS brain states were compared using pairwise two-tailed t-statistics. We utilized a minimal and standard computational model of synchronization (Kuramoto, 1984). In line with previous work (Hellyer et al., 2015), we chose this model because it captures the same essential aspects of macroscopic dynamics as more complex models (Bhowmik and Shanahan, 2013). The Kuramoto model thus provides a good trade-off between complexity and plausibility, incorporating key anatomical constraints and modelling functional elements (Hellyer et al., 2015). This model is particularly suitable to assess signal correlations between distinct network nodes and, importantly, is capable of reproducing our experimental results. The model yields a simulation of whole-brain dynamics in which the (consistent) local effect of inhibitory TMS can be represented by reducing a single parameter, as described in detail below. Hence, our simulations allowed us to test the hypothesis that the distinct effects of early- versus late-visual TMS on widespread functional connectivity rely on an intrinsic timescale of neural processes that has been suggested to represent a general organizing principle for the primate cerebral cortex (Murray et al., 2014; Gollo et al., 2015). where ωi is the intrinsic frequency, and Wji is the normalized weight of the anatomical connection between regions j and i extracted from a group-averaged whole-brain structural connectivity matrix W (Roberts et al., 2016). where a= 0.01 Hz, b= 0.1 Hz, sa = min(s), sb = max(s). This distribution is depicted in Figure 4—figure supplement 3 and acts as a proxy for the hierarchy of timescales, which recapitulates the anatomical hierarchy (Murray et al., 2014; Gollo et al., 2015). In particular, ωFEF = 0.0782, ωV1/V2 = 0.0925, and the whole brain mean = 0.0883 were chosen to approximate the frequency of slow resting-state BOLD fluctuations. The parameters a and b were chosen to capture the outer extremes of the BOLD signal frequency bandwidth. The exponent (=2) was tuned to best match the baseline rsfMRI results. The representative connectivity matrix W used in the Kuramoto model – Equation (1) – was obtained from a sample of 75 healthy adult participants (Roberts et al., 2016). Probabilistic tractography was used to estimate the average number of white matter tracks connecting all pairs of brain regions (513 x 512= 262,656 connections; details in Roberts et al. [Roberts et al., 2016]). The resulting structural connectivity matrix was normalized. Probabilistic tractography combined with the relatively large sample size allowed an estimation of the average connectivity strength of pairwise regional connections in the adult population. To ensure that the findings of our model were robust to possible inaccuracies in streamline reconstruction, however, we ran the model using (i) a sparser structural connectivity matrix (30% density vs. original densely connected matrix), and (ii) a correction for the reconstruction of long-range connections (division of the original weights by the fiber distance between any two regions). These analyses replicated the original result showing that TMS of FEF increases the discrepancy between activity in this brain region and V1/V2, whereas TMS of V1/V2 decreases the discrepancy. This robustness is largely explained by the fact that FEF consistently has a high degree (i.e., is a hub) whereas V1/V2 is consistently a peripheral node with a comparatively low degree. We started by calibrating the model (varying λ) to closely match the baseline functional connectivity of the two stimulated regions (i.e., the network state prior to application of TMS) with the rest of the brain using the 513-region brain parcellation. To this end, we calculated single-subject 513 x 513 connectivity matrices using the previously preprocessed data (see Preprocessing of neuroimaging data section for details). We then performed 500 simulations for a period of 8 min (discarding 2.12 min of transient time) using the aforementioned model with random initial conditions for varying λ values. We then selected and fixed λ (=0.0028) for consistency, and verified that small variations did not unduly affect the dynamics. The simulated trials that best replicated the functional connectivity in the real data were selected for each participant. The final correlation between data and simulations for the average functional connectivity between V1/V2 (FEF) and the rest of the brain was r = 0.55 (0.45). The intrinsic dynamics of each node in the Kuramoto model were reduced to a single parameter, the natural frequency. To mimic the putative effect of inhibitory TMS on local oscillations (Wozniak-Kwasniewska et al., 2014) we ran numerous simulations (500 trials) with reductions in ω spanning from 10–5 to 10–2 Hz (for both V1/V2 and FEF). These simulations reproduced the topology of changes in functional connectivity between the two stimulation sites – V1/V2 (Figure 4—figure supplement 4a) and FEF (Figure 4—figure supplement 4b) – and the rest of the brain that were obtained following application of TMS in the participant group. We then quantified the average change in functional connectivity between these regions and the rest of the brain, and identified regions in which the changes in functional connectivity were statistically significant (Wilcoxon signed-rank test, Bonferroni corrected for multiple comparisons). Frontiers in Human Neuroscience 4:190. Frontiers in Systems Neuroscience 4:13. Stochastic dynamic causal modelling of fMRI data: should we care about neural noise? In: A Fornito, editors. Fundamentals of Brain Network Analysis. 1. London: Academic Press. pp. 137–161.. Philosophical Transactions of the Royal Society B: Biological Sciences 370:20140165. The Journal of Physiology 160:106–154. Evolutionarily novel functional networks in the human brain? European Journal of Neuroscience 24:2961–2966. Annual Review of Neuroscience 29:203–227. Trends in Cognitive Sciences 17:683–696. Thank you for submitting your article "A hierarchy of timescales explains distinct effects of local inhibition of primary visual cortex and frontal eye fields" for consideration by eLife. Your article has been reviewed by three external peer reviewers, and the evaluation has been overseen by Jody Culham as both the Reviewing Editor and Senior Editor. The following individual involved in review of your submission has agreed to reveal his identity: Michael Arcaro (Peer Reviewer). The authors combine fMRI, TMS, and computational modeling to investigate interactions between visual cortical regions. They find that cortical stimulation of posterior visual cortex (V1/V2) leads to an increase in BOLD correlations with FEF, but stimulation of FEF leads to a decrease in BOLD correlations with posterior cortex. The modeling work indicates that these changes are related to the intrinsic timescales of these regions. This is a truly impressive study. The multi-methodology approach and research question is very novel and the results have important implications for understanding the neural processes facilitating interactions along the cortical hierarchy. While all reviewers of the work were quite positive, they raised a number of concerns that should be addressed in a revision. Although the journal policy is usually only to provide a summary of the main points, given that the reviewers raised a number of important and thoughtful points that may be "lost in translation" by condensation, the full reviews are appended below. The Essential Changes are based on the post-review discussion amongst the reviewers and editor and are outlined below. We also strongly recommend the authors review the full list of suggestions from the reviewers and, at their discretion, determine whether they can improve the manuscript based on the constructive criticism provided. The editor did not think that suggested changes requiring collection of new data were essential, though there are some cases where additional analyses of the extant data could be beneficial in addressing the suggestions. 1) Most imperatively, two reviewers noted that there is some confusion between the concepts of anticorrelation and connectivity changes that is challenging for the interpretation of the results. Reviewer #3 states, "Positive and negative correlations are not synonymous with increased and decreased connectivity. The authors summarize their findings as "stimulation of early visual cortex selectively increased feedforward interactions with FEF" and " stimulation of FEF decreased feedback interactions with early visual areas." TMS of FEF resulted in a stronger anti-correlations with V1/V2. An argument could easily be made that connectivity increased in both cases, especially since these areas appear to be moderately anti-correlated at rest (see below)." Similarly Reviewer #2 points out that the interpretation of connectivity changes depends not solely on changes to correlation values but the magnitude of the r value with respect to no correlation (r=0). This must be clarified with more careful wording, unpacking of the specific effects (Figure 3) and better explanations/discussion. 2) Two reviewers (#2 and #3) raised questions about the localization of the TMS sites. This must be clarified. 3) Reviewer #1 raised concerns about the accuracy of the structural connectome on which the Kuramoto model is based. The other two reviewers agreed this was a concern so this must be discussed. 4) The Reviewing Editor raised a concern about the asymmetry in connectivity between FEF and V1/V2 at baseline and the other reviewers agreed this should be addressed. Specifically, the data in Figure 2 on baseline resting-state connectivity showing that a V1/V2 seed is negatively correlated with FEF while an FEF seed did not show a negative correlation with V1/V2. One would expect these effects to be roughly symmetric and it would be helpful to clarify why they are not. One possibility is that it's just a thresholding issue (e.g., 2b would show V1/V2 at a slightly more liberal threshold). Another possibility is that the seeds are not exactly in the same location as the sites that are correlated with the opposite seed). Please clarify. 5) Two reviewers agreed the manuscript would be strengthened by the inclusion of control sites in the connectivity analysis while a third reviewer disagreed. The most useful additional analysis that the majority agreed would be worth investigating would be to examine the connectivity of the V1/V2 site after FEF stimulation and vice versa. We suggest the authors check this out and see if it adds any value to the paper (and include it if it does or provide a brief summary in the reply letter if it doesn't). 1) I think the presentation of the key findings and the conclusions drawn needs to be improved. In brief, the key conclusion seems to be: inhibitory TMS leads to a local slowing of the timescale (frequency of dominant oscillations) at which an area operates; TMS of V1/V2 decreases and TMS of FEF increases the discrepancy in oscillatory frequencies between these two levels of the visual hierarchy; this explains why the former leads to increased bottom-up connectivity and the latter leads to reduced top-down connectivity. The authors get to this on fourth paragraph in the Discussion, but do not make it as explicit as I think they should. Moreover, it would help if this interpretation and the underlying hypothesis would be pointed out more clearly earlier in the paper, e.g. in the Introduction. 2) To support this conclusion, it would be helpful if not only the correlation between changes in ALFF and changes in connectivity were shown; additionally, it would be important to see the magnitude and direction of the local changes in ALFF, separately at both levels of the hierarchy, that are induced by TMS. 3) One potential concern for the whole-brain Kuramato model is the accuracy of the structural connectome on which the model rests. This connectome was derived from diffusion-weighted imaging data, using probabilistic tractography. It would be helpful if the authors could provide some reassurance that these connectivity estimates are robust and not overly affected by methodological problems of tractography, such as the known bias in reconstructing short- versus long-distance connections. 4) Testing the robustness of the functional connectivity results across a variety of preprocessing strategies for resting state data is a strong aspect of this paper. However, it did not entirely get clear what motion correction procedure the results eventually reported are based on. It would be helpful if this could be clarified. The aim of the study was to explore long-range connectivity changes (assessed by resting-state fMRI) resulting from a local decrease in excitability induced by continuous theta burst TMS (cTBS). The authors used cTBS to modulate excitability in the V1 and the R-FEF in separate sessions. Inhibition of V1 with cTBS led to an increase in functional connectivity between V1 and R-FEF. Inhibition of R-FEF led to a decrease in functional connectivity between R-FEF and V1. This is an interesting study that looks to combine brain stimulation and neuroimaging with modelling to address a clearly articulated question. 1) The authors suggest that there is a significant relationship between the amplitude of local BOLD signal within the FEF and changes in connectivity between FEF and V1 (Figure 3—figure supplement 3). Could the connectivity changes therefore be (trivially) explained by merely increased or decreased signal-to-noise in the seed region leading to changes in the connectivity? (If there is greater signal – and therefore greater variability – in the seed region, it is more likely that functional connectivity can be identified between that region and elsewhere). This is a difficult problem to address, and I admit I do not have an easy solution, but it should be at the least discussed. I admit that I do not understand the sentence "the effects remained after controlling for changes in mean BOLD signal between baseline and post-TMS sessions", which may be aimed at addressing this conflict. a) Can they demonstrate that the fluctuations in connectivity between V1 and FEF, separated in time as these scans were, cannot explain the changes here (i.e. is this just an effect of repeated rs-fMRI scanning, rather than a TMS effect)? It may be possible to get this data from existing datasets – a step towards this would be to study the differences between the two baseline sessions, though this would not account for changes due to differing time spent in the scanner. b) Are these changes specific to the stimulated regions? If the seeds for the functional connectivity analyses are placed elsewhere in the functional networks, can similar changes be elicited? And similarly for regions outside the networks? The authors have the data to perform these analyses. c) Are the changes seen specific to stimulation at these sites? If the network was stimulated at a different site, would this result in the same pattern of results (i.e. is this just a reflection of some perturbation to the network as a whole or does it reflect the specific connectivity between these regions). This would require more data to be acquired, but is important for their conclusion that these are specific effects. A step towards this might be to show that stimulation of the FEF does not lead to connectivity changes in the V1 seed and vice versa, which they have the data to demonstrate. 3) One of the major things I struggled with in this study is the authors' interpretation of ante-correlations. To me, the demonstration of a significant, negative functional connection between two regions is not a lack of a functional relationship, a point with which the authors seem to agree. Therefore, a numerical increase in the r value between two regions is not an increase in connectivity if it does not go through 0, but rather is a decrease in (inhibitory) connectivity. If it does go through 0 it is then a reversal of negative to positive functional connectivity and the interpretation is very different. This is an important point of interpretation, and is currently not clear in the manuscript. If I understand correctly, the authors suggest that inhibitory TMS to V1 led to an increase in connectivity between V1 and FEF. These regions were negatively correlated at baseline (Figure 2A). Does this increase in connectivity mean that these regions are now positively correlated or that they are less negatively correlated? In the caption to Figure 3B they state that these are "antecorrelations" but I do not see the data to support that. 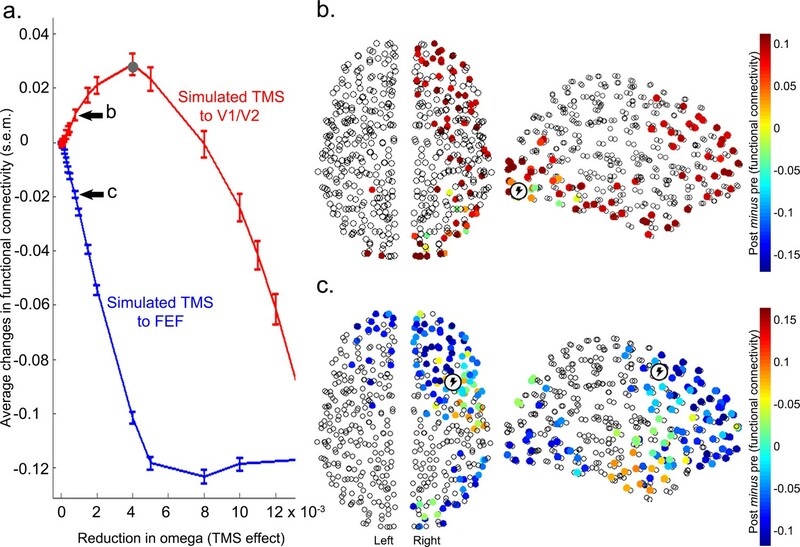 Likewise, inhibitory TMS to the right FEF led to a significant decrease in functional connectivity between this region and V1. Does this mean that there is now a significant functional connectivity between these regions, where there was not previously? The authors combine fMRI, TMS, and computational modeling to investigate interactions between visual cortical regions. They find that cortical stimulation of posterior visual cortex (V1/V2) leads to an increase in BOLD correlations with FEF, but stimulation of FEF leads to a decrease in BOLD correlations with posterior cortex. The modeling work indicates that these changes are related to the intrinsic timescales of these regions. This is a truly impressive study. The multi-methodology approach and research question is very novel and the results have important implications on the neural processes facilitating interactions along the cortical hierarchy. The manuscript is well written. Several aspects of the data that could affect the interpretation of the results need clarification. Specifically, the authors should evaluate potential influences of the underlying functional organization on the observed interactions, and address the differences between the imaging and modeling results. In addition, I have concerns on the specificity of the localization for both the imaging data and TMS. Conceptually, the authors also need to better address the relation of positive/negative BOLD correlations to increased and decreased connectivity. Positive and negative correlations are not synonymous with increased and decreased connectivity. The authors summarize their findings as "stimulation of early visual cortex selectively increased feedforward interactions with FEF" and "stimulation of FEF decreased feedback interactions with early visual areas." TMS of FEF resulted in a stronger anti-correlations with V1/V2. An argument could easily be made that connectivity increased in both cases, especially since these areas appear to be moderately anti-correlated at rest (see below). Are the observed interactions between V1/V2 and FEF generalizable to posterior visual vs. higher-order (frontal) regions? The modeling certainly appears to predict generalizable effects, but I'm not sure the imaging data specifically demonstrate this. Could the correlation patterns be related to the underlying topographic organization? Anatomical and functional studies in monkeys have shown that FEF and visual cortex is topographically organized with foveal and peripheral V1/V2 connected to differentiable portions of FEF (Schall et al. 1995; also see Babapoor-Farrokhran et al. 2013; Janssens et al. 2013). The particular increase/decrease in BOLD co-fluctuations may reflect where stimulation was applied relative to the functional organization of these regions (specifically retinotopy). This would still be an interesting result, but should be clarified. Given that TMS to FEF results in decreased BOLD activity in foveal V1, but increased BOLD activity in peripheral of V1 (Ruff et al. 2006; Ruff et al. 2009; Driver et al. 2010), were increases in BOLD correlations observed in peripheral V1/V2 for Post-FEF-TMS? Were any decreases in correlations observed in frontal cortex for POST-V1-TMS? If so, would this be predicted by the model? How precise was the TMS? Judging by the provided MNI coordinates, it's not clear that the closest gyrus on the surface is still within V1/V2. It's very close to lateral occipital extrastriate areas such as LO1/2. Given the lateral/medial distinction of FEF in the macaque, is it possible that TMS stimulation of FEF targeted a more foveal region than the seed region for the BOLD correlations? The authors should address sources of variability in the localization of areas. Closer evaluation of the correlation maps could potentially address this. While the pre- and post- TMS correlation maps of FEF heavily overlap in the ipsilateral hemisphere (Figure 3—figure supplement 1), there is some separation with the post-TMS increase located slightly more inferior and lateral. Slices end at z = 40 in this figure though. Does the increase in correlation post TMS extend further inferior? What is the relationship between the observed correlations in FEF and the seed FEF? 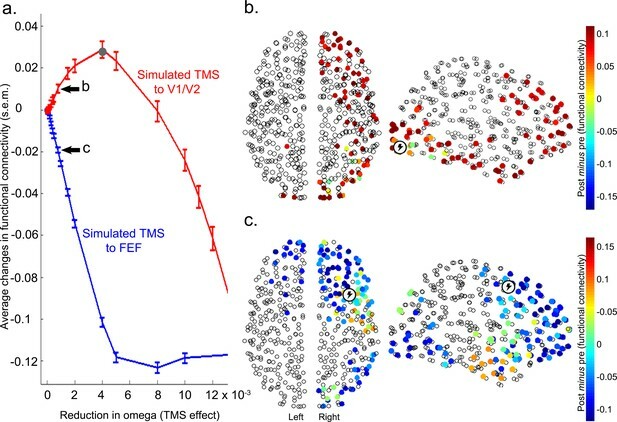 The model predicts that TMS to V1/V2 leads to a general increase in connectivity across cortex, and TMS to FEF leads to a general decrease. Can the model speak to potential topographically specific interactions as noted above? What accounts for the differences between the model predictions (Figure 4B) and the observed changes in BOLD correlations (Figure 3) post-TMS? Specifically, the model predicts increases in extrastriate cortex, temporal lobe, and much of the frontal lobe after TMS to V1 while changes in BOLD correlation are minimal in non-FEF frontal cortex, the temporal lobe, and extrastriate cortex (with the exception of a surprisingly specific increase in posterior parahippocampal cortex). There also appear to be increases in BOLD correlations within the parieto-occipital sulcus and retrosplenial cortex that are not clearly predicted in the model. After TMS to FEF, the model predicts large decreases in the frontal lobe and anterior, lateral occipital cortex (possibly near area MT) and increases in anterior temporal cortex, which are not apparent in the imaging data. I was puzzled by the data in Figure 2 on baseline resting-state connectivity showing that a V1/V2 seed is negatively correlated with FEF while an FEF seed did not show a negative correlation with V1/V2. One would expect these effects to be roughly symmetric and it would be helpful to clarify why they are not. One possibility is that it's just a thresholding issue (e.g., 2b would show V1/V2 at a slightly more liberal threshold). Another possibility is that the seeds are not exactly in the same location as the sites that are correlated with the opposite seed). Please clarify. I agree with Reviewer #3 that the folded surfaces make it hard to see some sites (esp. FEF) and this could be resolved with partial cortical inflation or other views (e.g., superior view to show FEF). Thank you for resubmitting your work entitled "A hierarchy of timescales explains distinct effects of local inhibition of primary visual cortex and frontal eye fields" for further consideration at eLife. Your revised article has been evaluated by Eve Marder (Senior Editor), Jody Culham (Reviewing Editor), and 3 reviewers (including Michael Arcaro, who agreed to reveal his name). The manuscript has been improved considerably and two of the reviewers are largely satisfied. However, there are some remaining issues that still need to be addressed, as outlined below. Although at eLife, we try to avoid putting authors through an endless gauntlet of unnecessary revisions, we also aim to ensure that published manuscripts meet our high standards. In this case, the remaining concerns were substantive enough that we think another round of revisions would greatly benefit the clarity and impact of the manuscript. Again, since the detailed points made by the reviewers were well articulated and are appended in full after the summary from the Reviewing Editor. 1) The manuscript has become clearer by rephrasing in terms of changes to positive and negative correlations (rather than just increases or decreases without respect to the initial sign of the correlation as in the first version). However, both Reviewer #3 and the Reviewing Editor still found it hard to interpret without an additional figure to show the post-TMS connectivity. (not just pre and post-pre changes). See their comments for details (Reviewer 3, Point 1; RE, Point 1). 2) Although based on your reply, we understand your justification for displaying data on the folded cortical surfaces, the problem remains that one of your two key areas (FEF) is hardly visible from lateral views. This can be solved simply by presenting either a superior view or a horizontal slice consistently in all figures (not just a subset as it is currently, e.g., slice on Figure 2A, superior view on Figure 3). And you may as well add an inferior view (to show lingual/fusiform cortex). 3) In the post-review consultation, the other reviewers reinforced a suggestion from Reviewer #3 (last line of Reviewer 3, Point 1). Reviewer #1 stated: I think the one issue to resolve is whether the model does or does not predict anti-correlations, that is, the authors should clarify the connection between their description in the main text and the results shown by Figure 4. Reviewer #3 raised two points that the other reviewers (in post-review consultation) were less convinced were essential to resolve. Nevertheless, the Reviewing Editor would encourage you to take this feedback into consideration in case you can use it to strengthen the manuscript. 1) Reviewer #3 (Point 2) still questions the asymmetry of the FEF and V1/V2 correlations,. The Reviewing Editor thinks that if it cannot be fully resolved, it should at least be made more apparent in the main manuscript (by showing the FEF clearly in extant figures and/or moving Figure 3—figure supplement 1 to the main text) and discussed. As is, the main figures don't show this because of the views presented). 2) Further consideration of the earlier results of Ruff and colleagues may be warranted (Reviewer 3, Point 3). The other two reviewers were less convinced of this and noted that the TMS methods by Ruff were quite different and your paper wasn't designed to examine the relationship between connectivity and retinotopy. Nevertheless, Reviewer #3 thought the manuscript could be more compelling on this front (for specifics, see "Added Comments from Reviewer #3 during Post-review discussion"). The Reviewing Editor will leave it as "your call" as to whether you can use Reviewer #3's suggestions to strengthen your manuscript or agree more with the other two reviewers that it is beyond the scope of your aims. Other points should be considered at the authors' discretion. I have gone through the authors' response and am happy with the additional analyses and revisions. My only (and slight) reservation is that the introductory sentence ("Probabilistic tractography.… allowed an accurate estimation of the average connectivity strength.…") to the section on "Anatomical connectivity" continues to be a little too optimistic, given that there is an ongoing debate about the pitfalls of tractography (e.g., see Reveley et al. 2015, PNAS). Otherwise, I do not see any major remaining problems and would recommend acceptance of the paper. The authors have provided a thorough and thoughtful set of answers to my comments and I have no further concerns. The authors made extensive revisions to the manuscript including several new figures and provided a thorough and thoughtful response to the previous reviews. While the revision addressed several issues, my main concern regarding the interpretation of the correlation changes and their relation to the TMS targets and seed regions remain. Seventh paragraph of Results section. "Inhibitory TMS of right visual cortex (V1/V2) resulted in the emergence of positive correlations between this region and bilateral FEF." – The difference maps in Figure 3 do not illustrate this and there is no reference to statistical measures. Are the post-TMS, positive correlations significantly different from 0? Or is there just a significant difference between baseline and TMS? It could be very informative to show correlation maps post-TMS for V1/V2 and FEF seeds w/o the baseline subtraction (ala Figure 2). Results section, subsection “Computational modeling”. "Simulation results showed that virtual inhibition of right V1/V2 within the model increased the positive correlations between this region and the rest of the brain (red in Figure 4a)," – I'm still confused about correlations in the simulation. This statement suggests that simulated V1/V2 connectivity with FEF started out positive and increased following V1/V2 inhibition. That is not entirely consistent with the imaging data (i.e., correlations were negative at baseline). Figure 4 does not illustrate which simulated correlations are positive / negative. This figure could be expanded to parallel the imaging data by showing the baseline connectivity and connectivity post-simulated TMS. Same section. "Conversely, simulated inhibition of FEF, again by slowing its intrinsic frequency, was associated with the emergence of significant anticorrelations in this region's connectivity with the rest of the brain (blue in Figure 4A)." – In the previous version, this was described as decreased connectivity, which I assumed was a lack of (any) correlation. Does the modeling result actually predict anticorrelations? 2) The authors refer to a common V1/V2 region (also FEF) across TMS targets, seed ROI and observed correlations. However, asymmetry in the correlations and anatomical variability suggest that this is not necessarily the case. The relationship between all three for V1/V2 and FEF needs further clarification. The data would be more compelling if the seeds were better matched to the observed correlations. For example, the FEF seed could be adjusted to be in better correspondence with the V1/V2 anticorrelations (or vice versa). Further, why not use the FEF seed as an ROI to evaluate correlations pre- and post- V1 TMS (and vice versa)? An ROI approach would be a more direct way for assessing correlation changes due to TMS (vs. the qualitative assessment of the correlation maps). The FEF seed is noted as being posterior and lateral to the V1/V2 baseline anticorrelation. From the Figure 1—figure supplement 1, the FEF TMS sites appear to be within the FEF seed, but also extend lateral and posterior, suggesting that the TMS-site for FEF and the anticorrelations with V1/V2 only partially overlap. The authors should better address whether such variability had an affect on the correlations. e.g., the authors could show something similar to Figure 3—figure supplement 3, but color code the FEF TMS sites based on the changes in correlation with V1/V2 (and vice versa). If the precise TMS location did not matter, there should be no difference in the correlations between the subset of TMS sites that overlapped with the V1/V2 baseline anticorrelations and the ones that didn't. Figure 1—figure supplement 1 nicely illustrates the relationship between the TMS sites and seed area, but could be improved. There is no reason to show the whole brain, and that only makes evaluation of the correspondence more difficult. Focal views of V1/V2 and FEF should be shown (such as in Figure 3—figure supplement 3). This figure would further benefit by illustrating the relation between observed correlation changes and TMS sites. e.g., showing the TMS target locations overlaid on a correlation changes post TMS. Figure 2—figure supplement 2. The control analysis did not yield significant negative FEF correlations with the V1/V2 seed. Is there still a significant increase in correlation when comparing these correlations to the post-TMS? 3) As stated previously, Ruff and colleagues (2006, 2009) found decreased correlations with foveal V1 and increased correlations with peripheral V1 after TMS to FEF. While their experimental paradigm differed with the current study and the reviewers' comment on state dependent effects is well taken, these prior studies looked at correlations during both task (visual) and rest (non-visual) conditions (and found no significant differences). Such findings are clearly relevant to the current work and should be discussed. How can these prior data (specifically the observation of both increases and decreases in V1 correlations) be reconciled with the current proposal on how TMS differentially affects the timescales of early visual cortex and frontal cortex? The current study proposes a general difference between early visual and higher order regions with interactions governed by their intrinsic timescales of processing. The Ruff studies found that interactions between early visual cortex and FEF vary depending on the topographic sub-region within early visual cortex. Aside from methodological differences, those data suggest heterogeneity in early visual-frontal interactions (there is also substantial evidence from monkey studies showing heterogeneity of anatomical connections and function within both FEF and V1). It's unclear to me how any such heterogeneity can be directly accounted for by the current study's broad short and long timescale differences in early visual cortex and FEF, respectively. More so, it actually seems that their model predicts the opposite (lack of heterogeneity). I think an argument potentially could be made that any heterogeneity in correlations reflects the heterogeneity in connections, though it's not clear to me what that mapping would be, and their data do currently do not speak to this. On a related note, higher precision in the targeting could mitigate this issue. I completely agree with [one reviewer] that there is a limit to what the authors can do in regards to the localization. However, they easily could have performed seed-to-seed correlations or used an areal atlas (particularly for V1), which would be much more of a control in localization than what they currently have done. These are very simple analyses, and frankly, I don't understand why these weren't done in the first place. I completely agree with [another reviewer] that it would not be fair to expect the authors to directly address this in their paper as their model clearly wasn't intended to test retinotopy or any other areal substructure. However, I think it's reasonable to expect the authors to have an idea (discuss) on how their model would fit within the well established architecture of the brain regions they've specifically investigated, particularly since their imaging results look like they do not encompass the whole area of V1 or FEF. For clarification, I was referring to the eccentricity specific correlations for visual areas V1-V4 from TMSing FEF in the Ruff 2009 paper, which seems to expand upon the V1 result in their 2006 paper. In trying to wrap my head around the data given the new presentation in terms of not just the direction of changes but their effect on positive and negative correlations, I had to make visual comparisons of Figures 2 and 3. That is, I was trying to see whether increases/decreases in connectivity (Figure 3) meant increases/decreases in positive/negative correlations. I thought it would be easier for readers to understand this if (1) an additional figure were presented in the main manuscript to show post-TMS connectivity (not just differences in connectivity); and (2) the same brain views were presented in the same order (as is, Figure 1 doesn't show superior views to highlight FEF or inferior views to show the lingual and fusiform gyri). We thank the reviewers for highlighting our lack of clarity on this important definition. We agree that the sign of the correlations – positive versus negative – is not synonymous with increased and decreased connectivity, respectively. To avoid any confusion we now present the results as TMS-induced changes in positive or negative correlations (i.e., anticorrelations) relative to baseline. The figure legends for Figure 3, Figure 3—figure supplement 3, and Figure 4 have also been amended to be consistent with the revised text. Please also see the revised Figure 3 and Figure 3—figure supplement 2. In these figures we have now used Post TMS > Baseline (red= increased positive correlations, blue= increased negative correlations) instead of the ambiguous terms of “increased/decreased connectivity”. Similarly we changed the text in Supplementary file 1. Finally, the section on DCM has also been clarified to highlight the unique contribution of this analysis over correlations between BOLD signals (i.e., functional connectivity). The localization of stimulation sites was initially based upon MNI coordinates in standard space defining the centroid of the targeted brain regions (e.g., FEF, Power et al., Neuron, 2013). These coordinates were then manually refined using established anatomical landmarks at the level of individual anatomy (e.g., V1/V2, Thiebaut de Schotten M et al., Cortex, 2014). As requested, we now provide a new figure (Figure 1—figure supplement 1) to clarify the location of the stimulation site for each participant. The estimation of structural connectivity was performed on data from a large sample of healthy adult participants (N = 75) using state-of-the art probabilistic tractography algorithms. These algorithms have good sensitivity (MRTrix: http://www.mrtrix.org/). However, to test the impact of possible biases in the connectome reconstruction on our computational findings we have now run two further analyses. First, we re-ran the model using a sparser structural connectivity matrix (i.e., 30% density). Dense structural matrices maximize the sensitivity (i.e., lower false negative in detecting fibers) but have lower specificity (i.e., increased false positives). Conversely, sparser matrices maximize specificity but lack in sensitivity. Running the model using different matrix thresholds changes the balance between sensitivity and specificity. Results from this analysis replicated the main results of the model (i.e., local inhibition of early visual cortex reduces the discrepancy in endogenous synchronization between lower and higher levels of the visual cortical hierarchy, whereas local inhibition of FEF increases the discrepancy). Second, we re-ran the model using a connectivity matrix that incorporated a correction for the known tractography bias in reconstructing short- versus long-distance connections. Because of the increased likelihood of randomly seeding larger long-range fibers, we have penalized the long-range connections by dividing the weights by the fiber distance (e.g., Hagmann et al., 2008). Model results obtained using this distance correction replicated those originally presented. Specifically, the variation in functional connectivity between the original matrix (TMS of FEF -> emergence of anticorrelations with V1/V2 of 0.07; TMS of V1/V2 -> increased positive correlations with FEF of 0.06), the 30% matrix (FEF -> emergence of anticorrelations of 0.04; V1/V2 -> increased positive correlations of 0.04) and the matrix penalizing long-range connection (FEF -> emergence of anticorrelations of 0.03; V1/V2 -> increased positive correlations of 0.08) were all consistent with the original findings. The Reviewing Editor is correct in expecting that the correlation between two regions should be roughly symmetric (i.e., functional connectivity between A and B should match that between B and A). The lack of a precise matching between the two is likely due to two factors. First, we performed a seed-to-voxel functional connectivity analysis and not a seed to seed (i.e., region-of-interest) analysis. This means that the clusters of voxels in FEF (V1/V2 seed analysis) and early visual cortex (FEF seed analysis) were similar but not identical. The absence of a significant anticorrelation between the FEF seed and early visual cortex at baseline may therefore be due to the fact that the FEF seed (red in the figure below) is located slightly laterally and posteriorly relative to voxels showing the highest anticorrelations with the V1/V2 seed (light blue in the figure below, Z= 50 as per Figure 2A). Second, while the topology of the two baselines (V1/V2 and FEF sessions) was almost identical (see new Figure 2—figure supplement 2), anticorrelations between V1/V2 and FEF in the FEF baseline did not quite reach statistical significance. (ii) Simulated inhibition of the right postcentral gyrus and left superior temporal gyrus could result in specific changes in functional connectivity between early visual cortices and FEF. 1) I think the presentation of the key findings and the conclusions drawn needs to be improved. In brief, the key conclusion seems to be: inhibitory TMS leads to a local slowing of the timescale (frequency of dominant oscillations) at which an area operates; TMS of V1/V2 decreases and TMS of FEF increases the discrepancy in oscillatory frequencies between these two levels of the visual hierarchy; this explains why the former leads to increased bottom-up connectivity and the latter leads to reduced top-down connectivity. The authors get to this on fourth paragraph in the Discussion, but do not make it as explicit as I think they should. Moreover, it would help if this interpretation and the underlying hypothesis would be pointed out more clearly earlier in the paper, e.g. in the Introduction. In keeping with our previous response, two sentences have been added at the end of the Introduction. This change also complies with the journal style of outlining the main results, and significance, at the end of the Introduction. We now provide a table of the individual ALFF values for each participant as a function of targeted region (i.e., V1/V2 and FEF) and condition (i.e., baseline, post-TMS, difference baseline minus post-TMS) – see new Supplementary file 2. This complements the changes now visualized in Figure 3—figure supplement 4. Please see our response to the 3rd main comment (Essential changes) for a comprehensive treatment of this issue. While we understand the reviewer’s concern, here we argue that such an explanation is unlikely to account for the specificity and directionality of our results. First, we have shown that local changes in ALFF – following an identical stimulation protocol – are correlated with changes in functional connectivity and that these changes occur in opposite directions for the two TMS targets. That is, while a TMS-induced reduction in local ALFF correlated with the emergence of positive correlations with FEF following V1/V2 stimulation, a TMS-induced reduction in local ALFF correlated with the appearance of significant anticorrelations following stimulation of the FEF. Second, the fact that the correlations remained comparable after controlling for changes in mean BOLD signal across sessions further limits the likelihood that such correlations were simply driven by general fluctuations in SNR. Finally, we also examined activity within homologous visual areas in the opposite (non-stimulated) hemisphere. There were no significant correlations between changes in functional connectivity and changes in the amplitudes of slow signal fluctuations (ALFF values) extracted from homologous visual areas in the left hemisphere. Please refer to our response to the above “Recommended considerations”. Our extensive new control analyses, on real and simulated data, directly address the reviewer’s concerns. Several sections of the manuscript have been revised accordingly; please see our response to the first comment in the section “Essential changes”. Positive and negative correlations are not synonymous with increased and decreased connectivity. The authors summarize their findings as "stimulation of early visual cortex selectively increased feedforward interactions with FEF" and " stimulation of FEF decreased feedback interactions with early visual areas." TMS of FEF resulted in a stronger anti-correlations with V1/V2. An argument could easily be made that connectivity increased in both cases, especially since these areas appear to be moderately anti-correlated at rest (see below). We agree with the Reviewer’s comment and have changed the text accordingly. Please refer to our response to the first comment in the “Essential changes” section. In the original analysis (Figure 3) broader changes did not quite reach significance. In fact, inspection of the experimental data (Figure 4—figure supplement 3) suggests that sub-threshold changes in connectivity patterns occurred in regions comprising the frontal-prefrontal cortices and visual areas in the occipital cortex (as predicted by the model). The proximity of the FEF stimulation sites and the relatively sparse effect of TMS precludes any unequivocal assessment of distinct changes between FEF sub-regions and foveal/peripheral cortical areas. We did, however, endeavor to address the reviewer’s query by testing for possible associations between the anatomical location of the stimulated sites and the broad changes in local neural activity (ALFF) and functional connectivity following TMS (new Figure 3—figure supplement 3, see below). These additional analyses failed to establish any clear link between the locations of the TMS sites, changes in local signal power (ALFF) and distal changes in functional connectivity. Finally, there were no clear associations between changes in ALFF and individual TMS target sites (Figure 3—figure supplement 3). Given that TMS to FEF results in decreased BOLD activity in foveal V1, but increased BOLD activity in peripheral of V1 (Ruff et al. 2006; Ruff et al. 2009; Driver et al. 2010), were increases in BOLD correlations observed in peripheral V1/V2 for Post-FEF-TMS? We did not find this to be the case in our data (i.e., FEF stimulation did not cause the emergence of significantly positive correlations with V1/V2). This result could be due to the fact that we assessed resting-state dynamics and not task-based dynamics (for comments on state dependent effects of brain stimulation see Silvanto and Muggleton, NeuroImage, 2008, Silvanto et al. TICS, 2008; for recent reviews see Sale et al., Neurosci Biobehav Rev., 2015 and Miniussi et al., Handbook Clin Neurol., 2013). Were any decreases in correlations observed in frontal cortex for POST-V1-TMS? If so, would this be predicted by the model? How precise was the TMS? Judging by the provided MNI coordinates, it's not clear that the closest gyrus on the surface is still within V1/V2. It's very close to lateral occipital extrastriate areas such as LO1/2. As requested, we have now provided a figure showing the locations of the stimulation sites in each participant, in standard brain space (Figure 1—figure supplement 1). A closer analysis of the TMS sites in relation to the known functional and structural definition of extrastriate visual areas indicates that we indeed targeted a region comprising areas V1/V2 (e.g., see figure below, A= modified figure from Malikovic et al., Brain Function and Structure, 2016). This panel shows the position and extent of cytoarchitectonically defined visual areas in the right hemisphere of ten human brains, B= TMS sites used in our study). Given the lateral/medial distinction of FEF in the macaque, is it possible that TMS stimulation of FEF targeted a more foveal region than the seed region for the BOLD correlations? Our results do show a relatively widespread effect of FEF stimulation on V1, V2 and other extrastriate visual areas (Figure 3). This lack of specificity is most likely due to a relatively broad perturbation of FEF. In fact, both lateral and medial FEF regions are likely to be affected by stimulation. The authors should address sources of variability in the localization of areas. Closer evaluation of the correlation maps could potentially address this. While the pre- and post- TMS correlation maps of FEF heavily overlap in the ipsilateral hemisphere (Figure 3, supplement 1), there is some separation with the post-TMS increase located slightly more inferior and lateral. Slices end at z = 40 in this figure though. Does the increase in correlation post TMS extend further inferior? What is the relationship between the observed correlations in FEF and the seed FEF? Several factors might explain the discrepancies between the threshold results of the modelling and the experiment. In general, the model represents a considerable simplification of the underlying complex neuronal processes. Thus, the correspondence between the computational model and the empirical findings is necessarily limited. For example, empirical data are limited and thus underlying effects may not reach statistical thresholds. There are likely also considerable regional heterogeneities and related complexities that are not incorporated in the model. We have discussed the need to address possible discrepancies between model and data with the aforementioned edits to the Discussion (see above). Please refer to our response to the fourth comment under “Essential changes”. To address this issue, we extracted single-subject average baseline values of functional connectivity in key clusters showing a significant TMS effect. We then calculated group-level mean connectivity, for both baseline and post-TMS clusters. These results are now presented in a new Table (Supplementary file 2,). They allow a quantitative assessment of the direction of changes in functional connectivity induced by TMS. As requested we have updated Figure 2, Figure 2—figure supplement 1 and Figure 2—figure supplement 2. These figures now present both the superior and inferior views. To address this comment we have added a new supplementary figure (Figure 4—figure supplement 1) showing that the model predicts both the reduction of positive correlations and the emergence of anticorrelations between the right FEF and right V1/V2 following inhibitory TMS of FEF. 1) Reviewer #3 (Point 2) still questions the asymmetry of the FEF and V1/V2 correlations. The Reviewing Editor thinks that if it cannot be fully resolved, it should at least be made more apparent in the main manuscript (by showing the FEF clearly in extant figures and/or moving Figure 3—figure supplement 1 to the main text) and discussed. As is, the main figures don't show this because of the views presented). See our response to Q2. (Essential Changes) above. Human subjects: The study was approved by The University of Queensland Human Research Ethics Committee. Written informed consent was obtained for all participants. © 2016, Cocchi et al.